First Line: "Forgive me, Father, for I have sinned." 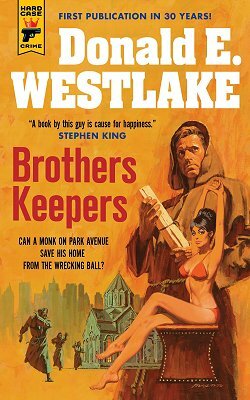 Having heard many good things about Donald E. Westlake, I looked forward to reading Brothers Keepers. After all, what in the world can a group of sixteen monks do when their 200-year-old monastery on Park Avenue in New York City is condemned to make way for a new high-rise? It's a miracle they knew about it at all. If not for Brother Benedict's weekly purchase of the Sunday New York Times, they might have been blissfully unaware until the wrecking ball showed up at their door. Once they know, however, they move as quickly as possible in an attempt to save their home. Humor is one of the most subjective things there is, and I'd heard a lot about Westlake's. Although I did smile a time or two at Father Banzolini's way of listening to confession, I did not find the book overly funny. In fact, the entire book didn't grab me at all even though I could appreciate how well it was written. That happens sometimes. No matter how well someone writes, a book just doesn't pique a reader's interest. I'm glad that I did read a Westlake novel and can move on. Your mileage, of course, will definitely vary, and I hope you do enjoy Brothers Keepers. Well, my comment would be that the cover is definitely a 'vintage' one - ha! I don't think I've read anything by this author and I'm not really encouraged to do so from this. Sorry. Ha! Well, you read it so I don't have to is how I'd put this. That cover is like the Mickey Spillane book covers I used to see as a teenager, which turned me off to reading the books.